Steven Moffat and co. have kept fans waiting for the new season of Sherlock for far longer than I even feel comfortable uttering. Seriously, it’s been so long since we’ve gotten a new episode that I sort of feel queasy in my stomach every time I think about it. I know Benedict Cumberbatch has been busy being Khan and Martin Freeman has been busy getting his hobbit feet on, but it still is frustrating to think the last episode of Sherlock aired like a year and a half ago, and we are still at least several months away from the Season 3 premiere. That’s the bad news. The good news is that Masterpiece released a new trailer for the show today, and it is pretty spectacular. I don’t like to use the adjective “spectacular” lightly, but anytime I get to see a main lead with an unusual mustache (in this case, Freeman), I think a teaser has gone above and beyond. Additionally, we get a quick look at some shots of Mrs. Hudson, Mycroft Holmes, and more from the supporting cast. 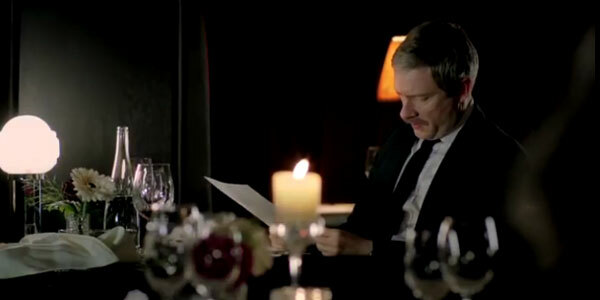 Honestly, other than Sherlock meeting up with Watson at a restaurant, there’s not a lot going on, but it’s still worth a watch if you are super excited for the new season. Before continuing, here’s that shot of Freeman with the ‘stache. The best news we get from the short, 31-second promo is the “to be continued …” message appearing right at the end. This means that we’ll likely get a series of promos that are related to one another and will hopefully eventually give us some hints about the upcoming season. The trailer may not reveal much, but we do know a few things about Season 3, thanks to the show heading to Comic Con this year and thanks to the cast and crew occasionally throwing us a few tidbits. 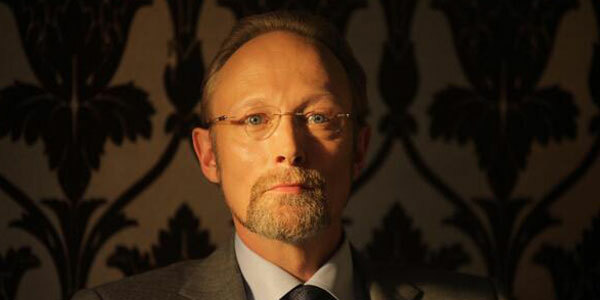 Mark Gatiss announced a few months ago that the first episode will be called “The Empty Hearse,” which is likely based on Sir Arthur Conan Doyle’s short story “The Adventure of the Empty Hearse.” We even know that the villain this time around will be Charles Augustus Magnussen, which seems to be a play on several names from the Holmes canon. We don’t catch him in the preview, but he looks pretty creepy. Sherlock is expected to return to the schedule for another 3-episode arc toward the end of 2013 in Britain, which means fans of the series in the United States can expect new episodes sometime after the new year. We’ll keep you posted as soon as PBS announces an official premiere date. In the meantime, keep your eyes peeled for more promos.